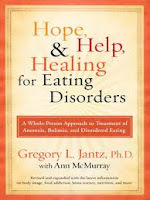 The book Hope, Help & Healing for Eating Disorders was written by a certified eating disorder specialist, Dr. Gregory L. Jantz. His work with sufferers of eating disorders and "disordered eating" form the basis of the book. He describes disordered eating" as someone who may not suffer from a traditional eating disorder, but one whose life is nevertheless controlled by thoughts of food (when to eat, what to eat, how much to eat, how to avoid the effects of what was eaten, etc.). The approach of the book is to look at the whole person when attempting to resolve problems people might have in their relationships with food. Each chapter takes an issue and then looks at it from emotional, intellectual, physical, relational and spiritual aspects. An interesting part of the book is the "Food for Thought" section which comes near the end of each chapter. These sections consist of exercises that the reader can complete in a journal. One interesting exercise had the outline for the reader to write his or her own obituary. Jantz points out that eating disorders may actually lead to death, and therefore it is important to think about what would you would want to be said about you after your death. A bit shocking, perhaps, but relevant! Dr. Jantz realizes that there is something in the past that has caused the person to have an unhealthy relationship with food. He discusses many aspects (including examples) of things such as family patterns, repressed anger, abuse and so on that are common in the backgrounds of so many people who suffer from eating problems. He also includes sections on physically recovering from the disorders, implementing forgiveness, mapping progress, and allowing others to help. The book ends with an interesting Q & A section about eating disorders, as well as related books and Internet sites that would be useful for further exploration of the topic. Overall, I found the book to be a useful overview of all aspects of eating disorders: examples, possible causes, physical implications, and strategies for recovery. If a sufferer were really and truly motivated to examine his or her situation and do the difficult and painful work of honest self-evaluation, I believe this book could be extremely helpful in the recovery process.